strong>Editor’s Note: Acoustic engineer, inventor, Massachusetts Institute of Technology professor, and founder of the loudspeaker manufacturer bearing his name Amar G. Bose died July 12, 2013, at age 83. The Philadelphia native invented his new kind of stereo speaker, based on psychoacoustics, in the early 1960s. He founded the Bose Corporation in 1964, which introduced the 901 Direct/Reflecting speaker system in 1968 and later the Wave radio and noise-cancelling headphones. Bose’s company began engineering speakers for automobile stereos in the early 1980s, quickly becoming the most popular purveyor of premium car audio systems. About the same time, Bose and his research engineers began work on adapting power amplification, high-speed switching, and electronics to automotive electromagnetic suspensions. Bose hinted at this development in an interview with Jamie Kitman for Automobile more than six years before he unveiled the Bose Electronic Suspension to the automotive press. Kitman’s interview with Bose, first published in November 1998, is reprinted below. Dr. Amar G. Bose, a professor of electrical engineering and computer science at the Massachusetts Institute of Technology, founded Bose Corporation in 1964 to manufacture loudspeakers showcasing his numerous patents and unconventional theories in the areas of sound and psychoacoustics, the science of human perception of sound. From modest beginnings, this privately held corporation (Bose is the sole shareholder) with an unusual philosophy (all profits are reinvested back into the business) has become the world’s largest manufacturer of loudspeakers, with 1997 sales of $850 million. 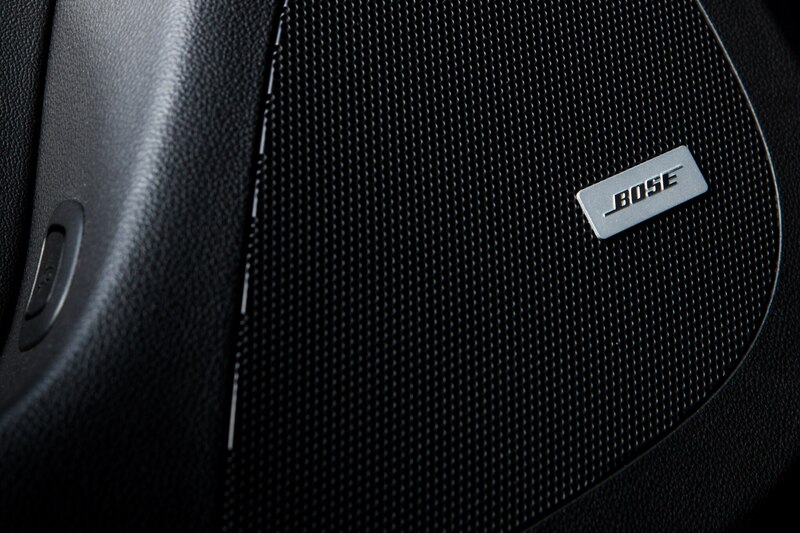 In addition to high-level contracting with the armed forces and airplane manufacturers, Bose has also emerged as a leading designer and original-equipment supplier of high-grade audio equipment for automobiles. From its first car-audio installation in the 1983 Cadillac Seville to the present, when several General Motors divisions use Bose’s unique services—along with Acura, Audi, Infiniti, Mazda, Mercedes-Benz, and Nissan—the company has been notably successful in demonstrating to a once-skeptical automotive industry that consumers will pay a premium for quality car audio. At the same time, Bose Corporation has illustrated the potential benefits to carmakers of subbranding—attaching the halo of another firm’s good name to your own. Jamie Kitman, who first learned of Bose when he decimated his life’s savings purchasing a set of the firm’s 501 Series loudspeakers in the summer of 1974, visited the doctor at Bose’s Framingham, Massachusetts, campus. We hear so much nowadays about the power of Wall Street, yet here you are, a privately held company with no shareholders other than yourself, enjoying remarkable success. Could you explain your decision to avoid outside investors? Going public is analogous to having a chess match in which you tell one side that you must take the maximum number of players from the board on each move. And then the person must engage in totally short-term thinking. “How do I maximize my income,” which is the number of the players, “on the next move only?” He’s not thinking a move ahead or a move beyond that. And that’s almost a certain formula for getting wiped out on the chess board. I saw similar things in public companies with huge corporations spending so much effort and time keeping up public relations and the image instead of working on the object, doing the R&D. I’m not criticizing, because they’re trying to do what they think the stockholders or the market would like to see. But that’s not exactly what I wanted to do. For me, maintaining the private corporation was essential. And when we got around to the OEM (original-equipment manufacturer) part of it, that would never have been possible had we been a public company, because that year the Federal Reserve raised interest rates to 22 percent. We spent $15 million doing that first car, with no promise of a return. The market wouldn’t have gone for this, and the banks didn’t like it. But this was the research that would lead us to the GM project. How did the Bose system for the 1983 Cadillac Seville come about? I was talking to (the late) Jerome Weisner, who was president of MIT. Jerry had a very big interest in acoustics, and we were talking about them in general. I told him that one day I believed it would be possible to produce better sound in an automobile than in the home, and he wanted to know why. I told him that regardless of what the environment is, if you know it, then you can design for it. So in a car (I thought) we ultimately ought to be able to overcome the three fundamental limitations that exist in the home. Namely, we don’t know what room (an audio system is) going to be put in, what the wall covering will be, what the furniture is…We have no control over the location of the speaker, which is very critical. The third parameter we can’t control is where you sit. In the car, we would be able to control these parameters. As I was leaving, Jerry said, “Do you really want to leave it as an academic discussion?” And I said, “What do you mean?” And he picked up the phone and called the vice-chairman of General Motors, whom he knew well, and said, “Look, there’s someone here you ought to listen to…(He has) an approach (to audio systems) that may have a lot to do with the future.” That led to an invitation to make a presentation. Do you recall who was there? Oh, yes. The key person at that first presentation was Ed Czapor, an incredible individual who was at that time the head of Delco Electronics, which was the world’s largest manufacturer of automobile radios. I would say almost any other manager would have thought, “Hey, what’s this outside firm doing coming in here?” You know, “We are the biggest and the best.” So first we had a telephone discussion. And I said: “Look, you’re the world’s largest manufacturer of car radios—you may not need any help at all. And furthermore, if you do need help, there are plenty of companies to look at. And so I’m just calling in response to the initiation from Weisner.” And right away he said: “We are always looking for help. A better way to do something—we are interested in that.” He was an absolutely unusual man. Even our people here said there was no hope going into the business. They thought I was nuts. The first two hours I spent on purely technical discussions. And the second two hours on marketing, because they were having big problems. The Japanese companies had spies inside Delco, and they would introduce exactly the same electronically tuned model on the same day in the same magazines. And it would fit right in their cars. The high-line radio option at a much lower price. Very attractive for a new car dealer. But a real problem for GM at the time. And the answer was your system, designed specifically for their car? This was the first sound system that had ever been designed for a specific car. Even Roger Smith—who was a strong supporter and made it all possible, because this decision had to be made by him, finally—didn’t think it was going to fly. Something that people couldn’t see that cost 900 bucks? But at least he wanted to try. What about Smith’s role in the process? I told Czapor that the bank we were dealing with was upset about the money I was spending. I told him that, you know, the banks were really trying to close in on us. Smith found out from him. And he stepped in to help. Wait. You have this conversation with Weisner, he calls up GM, you have this meeting with Delco, and that’s the point where you start the R&D, without even a cent from GM? Yeah, we said: “Give us a Seville and ninety days later we will give you back a first model. (This car) won’t be what we would get for production, but it will be so much better than what anybody has in their car that you will be able to judge whether there is potential.” That started in September 1979. I mean, Fisher Body would have to move window-winding motors and all to get the speakers exactly where we had to have them. They said it couldn’t be done. And we wound up putting our designers in their design studios making these changes with them, so that they could do it at no cost. This was a big part of our expenditure, still before there was even an agreement to purchase. But that’s why GM was so kind to us and came to our rescue, I think. At one point we were told by GM: “Everybody comes to us and says, ‘Here’s my widget and here’s how much I want. ‘ And you were the first ones that came and said, “We have an idea and we think it really has potential and we’re going to develop it,’ and didn’t ask for anything—no purchase order, nothing.” And so, when they found out we were having trouble with our bank, they came running in and said, “What’s the problem?” Then Roger Smith made a phone call, and they had another bank take our outstanding loan and pay it off, $14 million. It probably meant our survival. In those early days we had a relationship that most people wouldn’t believe. And when it came time to produce equipment, GM sent people to our company. We weren’t really in the electronics business at that time, and that was obvious to them because they were, in a big way. And they actually started sending in free equipment. And, for several months, some of the best production people. They did incredible things. The average person wouldn’t believe it if you told them a corporation would do this, for no charge. That’s when GM said, “Look, you went your mile a long time ago, it’s time we go ours.” That was the exact statement. Nobody in big business today would ever believe it happened. And, if it weren’t for Ed Czapor and Roger Smith, it never would have. Then the other automakers came along? We’ve had companies who have boldly told us that you will put the loudspeakers in this position. And we would test that. We knew in the beginning that it probably wouldn’t work. We told them that. We tested it. And we refused to do it. If we supply a sound system that is anything but the best, it’s not just their reputation that goes down—ours goes down! We’ve been approached by some (companies) who just want the Bose name. They want a standard, run-of-the-mill thing where you buy the loudspeakers from one of the Asian countries and just put ’em in, but you give them the rights to use the Bose name. We won’t go for that. Our goal, basically, is very clear. We will try to put the best sound into whatever acoustical shell we work with. Very often, the best sound in an acoustical shell that belongs to a less expensive car is a less expensive system, because there’s no point—if the environment is the dominating factor—in putting fancy things in that won’t come through. You have, for instance, less insulation in the smaller car. Smaller is not optimal for the sonic environment. Aside from things like road and wind noise, what are the basic challenges of car audio? Sound travels about a foot in a millisecond. So when you’re in a concert hall, you can count on a couple of hundred milliseconds between the time the sound wave comes to you and the time the next one bounces off the wall and hits you—there are millions of these reflections, spaced in time. Your living room takes a step down from that. In a car you’re talking about a few milliseconds, ten milliseconds maybe. That’s not easy to deal with—so you have to do a lot of psychoacoustic work as well as physical acoustic work. Could you define those terms? Physical acoustics is defined by the relationship between the physical device and the measurements that you make on it: the sound level, the directional pattern, the frequency response. Psychoacoustics describes the relationship between those measurements and what the human perceives at the other end. That’s where our sound research at MIT started. Why did things sound terrible yet measure well? Once you were underdogs; now you are top dogs. Still, you don’t do things at Bose halfheartedly, solely for the money, and you don’t copy the other guy for short-term gain. There are parallels, it seems, between the way you run a company and the way one leads an honorable, productive life. An enormous number of parallels. You know, the simplest cell has a life span. And organizations of cells, whether animals or institutions, also have a life span. Organizations of people, as they grow larger, get complacent. People don’t have the same drive they did in a small corporation where survival is an everyday affair, and that makes room for new ones coming in. New people who are willing to work twelve hours a day to get an idea across and built. Large companies, with all their facilities, are not as efficient. And that makes way for new ones. And the best you can hope for is the same thing you hope for in your life, namely that you can keep healthy—physically and mentally—for the span of your life. What do you see for Bose Corporation once you’re gone? Well, there are a lot of people who have been here for a long time, and I hope I’ve developed some people who have similar views. So I would expect it to go on for a while with the same philosophy. What happens after that? Are those people going to have the same drive to select leaders of that type? My guess is, eventually it’ll slip into mediocrity. Over the years, you’ve probably learned much about the inner workings of cars. I expect people would be curious to know what you think of automobile design in general—what innovations might be made or what dead ends have been standardized? Well, I do have a great interest in this, but the only thing I can tell you about it now is that if we have, shall I say, luck or the necessary skill to make it happen, within a couple of years we will invite you to a press conference that has nothing to do with sound and everything to do with automobiles. It’s a project we’ve worked on for eighteen years. That’s all I can tell you. But you will see an automobile that will perform like no other. Would your innovation have anything to do with suspension systems? You must love to open your presents before your birthday. But let me say if I launched a program like this in a publicly held company, that was eighteen years (in development), and could still not say with certainty that it would ever be a product, I wouldn’t have survived as chairman.